KING CHARLES THE UNUSUAL was the most famous guinea pig on earth during his lifetime, but is now sadly almost forgotten, except in a few volumes lying on dusty library shelves, in which his strange and tragic life has been recorded. He was born the only boy in a litter of six to his parents, Restless King Ag and the lovely Queen Parthenope. Four of Charles’ sisters, Glad, May, Sad and Bellubulub, survived to adulthood, but King Charles always felt closest to his youngest sister, Bean, who sadly passed away after developing a bad sneeze, aged only twenty minutes. Biographers believe King Charles never recovered from the loss of Bean, (pictured) and it explains a lot about him. Growing up, Charles was a bit of a personality. His thick pleasant fur grew in many different directions and several different colours. He was fond of long country walks by himself and had a remarkable collection of green buttons which he wouldn’t let anyone else see. Glad, May, Sad and Bellubulub all decided they didn’t want to be Queen because they couldn’t keep still during the national anthem. So when the time came, after Restless King Ag and lovely Queen Parthenope slipped out the back door, the golden crown was placed upon Charles’ fluffy head. Thence began one of the strangest kingships in history. of guinea pigs with particularly sharp teeth and who roamed the land day and night searching for law-breaking carrot eaters. Soon the prisons were overflowing with offenders. became King Charles’ most trusted advisor. He was very weird. He spent a lot of time sitting on hens’ eggs and was frequently found in local taverns singing community songs, which was where in fact King Charles met him. But these were minor things. More dangerously, Orlovo claimed that he could summon up the spirit of Bean, King Charles’ much beloved little sister. He said that the spirit of Bean told him things. This was all right at first, when all Bean mentioned was the benefits of a good diet and several uses for an old umbrella. But then one morning Orlovo declared that the spirit of Bean had told him King Charles should give him, Orlovo, half the kingdom. Orlovo blinked. His eyes were deepest pink. Unable to resist Orlovo’s penetrating pink stare, King Charles had the documents drawn up to hand over half his kingdom to Orlovo. King Charles’s sisters were very alarmed by this turn of events, especially Bellubulub, who was inclined to be cynical. These questions made King Charles very angry, and he banished Bellubulub from his realm. But she laid low in the thick bushes on the borders of the kingdom, gathering around her any number of unhappy guinea pigs, especially those that were missing the taste of nice fresh carrot flesh. Eventually there was a revolution. It was very unpleasant for everyone. Guinea pig fought guinea pig in brutal claw to claw combat. After a desperate clash, the half a kingdom that King Charles had given away was seized back from Orlovo, who was last seen scuttling down a gutter and disappearing into darkness. With Orlovo gone, King Charles then got a terrible headache, and took refuge from all the noisy carry-on in an old tin bucket. Before long he was surrounded by his Peruvian guards who had turned against him, even the female ones, which was very shocking. However, naturally there is only so long even the bravest king can last without food or water, or, in King Charles’ case, without even a single green button to play with. He emerged from the bucket just on an hour and a half after the revolution began, looking very sad and sorry for himself. Princess Bellubulub, I mean Queen Belubulub the Magnified took over the throne. King Charles was dragged to the dark and nasty prison at the back of the palace. 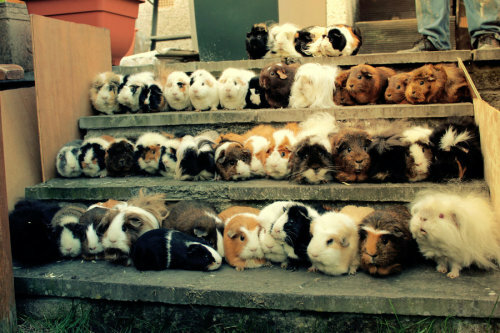 The prison doors were flung open and hordes of guinea pigs locked up for illegal carrot eating came pouring out in their thousands, in a stampede of joy. King Charles was then roughly ushered into a dismal cell, and the key turned in the lock. Click. King Charles lived out his life in solitary confinement, quietly treading his exercise wheel every morning and composing very short poems (some of them only had one word) in the afternoon, before falling into a sad and dreamless sleep. At night he could be seen staring wildly at the moon, yearning perhaps, for a happier world, which had never in truth existed. Faithful to his principles, he refused to eat carrots right up to his death, seventeen years after his overthrow. He was buried at midnight in the Royal Crypt, next to the grave of his beloved sister Bean. Now this is a sad story, but try not to be too sad. I believe Queen Bellubulub the Magnified had few complaints at how everything turned out. 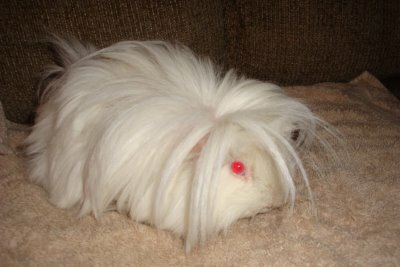 And just think of all those other guinea pigs, released from prison at the height of the revolution. Their story would be a very happy one, if anyone would write it down in a history book.